Tilda is a free, open source, highly customizable and configurable GTK based drop down Terminal emulator for Unix-like operating systems. Unlike other traditional Terminals like gnome-terminal (Gnome), Konsole (KDE), MATE Terminal (MATE), xterm and many others, Tilda has no border window and is hidden until a key or keys pressed. It’s design was inspired from the classical Terminals used in first person shooter games, Quake, Doom and Half-Life to name a few. It has no border window, menu bar, title bar, and minimize or maximize buttons. It can be pulled up and down when a key is pressed. Tilda is popular among developers and those who are using Terminal mostly to perform almost all tasks. In this brief guide, we will see how to install and use Tilda in various Linux operating systems. Tilda is a available in the default repositories of Arch Linux and its derivatives like Antergos, Manajaro Linux. So, you can install it using pacman as shown below. Once installed, launch it from Menu. In Gnome, Tilda usually found under Applications –> Accessories –> Tilda. In MATE desktop, you can launch it from Applications -> System tools -> Tilda. This is how Tilda Terminal emulator looks like after you launch it. As you see in the above screenshot, Tilda has no border window, menu bar or tittle bar. By default, it always appears on top of all applications. However, you can customize it as per your liking. Here is the default hotkeys to use Tilda. F1 – Pull down and pull up (Hide and Show) Tilda terminal window. SHIFT+CTRL+T – Open a new tab. SHIFT+CTRL+W – Close the active tab. CTRL+PAGE_UP – Go to previous tab. CTRL+PAGE_DOWN – Go to next tab. SHIFT+CTRL+PAGE_UP – Move tab left. SHIFT+CTRL+PAGE_DOWN – Move tab right. <ALT>1 – Go to tab 1. <ALT>2 – Go to tab 2. <ALT>3 – Go to tab 3. <ALT>4 – Go to tab 4. <ALT>5 – Go to tab 5. <ALT>6 – Go to tab 6. <ALT>7 – Go to tab 7. <ALT>8 – Go to tab 8. <ALT>9 – Go to tab 9. <ALT>0 – Go to tab 10. SHIFT+CTRL+C – Copy text from Tilda window. SHIFT+CTRL+V – Paste text in Terminal. F11 – Toggle full screen. SHIFT+CTRL+Q – Quit Tilda Terminal. To open Tilda configuration window, Right click on any empty space in Tilda window and choose Preferences. Here is Tilda config window. As you see in the above screenshot, Tilda has many options to tweak it as per our wish. Set what actions to be performed when last Terminal is closed. In Title and Command section, you can assign the title of Tilda, run a custom command instead of shell when launching Tilda, and so on. In Appearance tab, you can adjust the height, width, and position of the Tilda window. Also, you can enable transparency, animated pull down (hide) etc. In Colors tab, you can choose or set foreground and background colors for your Terminal window. In Scrolling tab, you can enable or disable scrolling, and also you can set the scrollback value to any lines of your choice. Quite useful for viewing source code and long Terminal output. In Keybindings tab, you can adjust/modify the hotkeys. 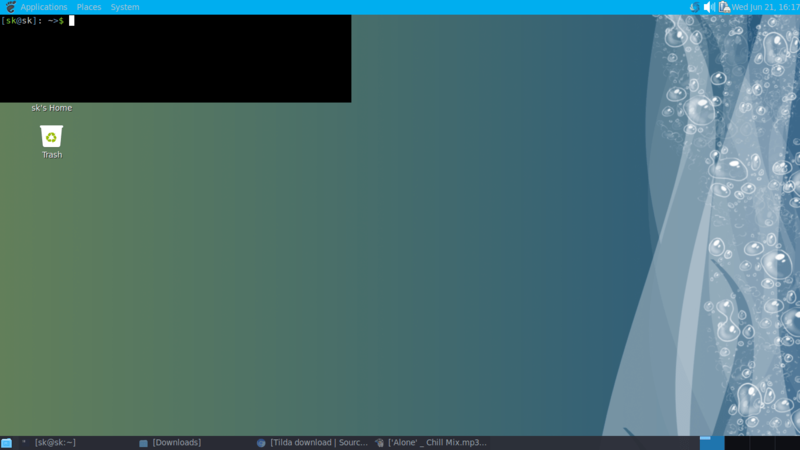 It is also possible to set Tilda Terminal as transparent wallpaper for your Linux desktop. Right click on Tilda Terminal, choose Preferences. Go to General tab, uncheck “Always on Top” option. Under Appearance tab, modify the height and width of your terminal as per your liking. I set 800×600 pixels. Check “Enable Transparency” option under Appearance tab, and adjust the “Level of Transparency” to any value of your choice. I chose 90%. Under Colors tab, choose “Green on Black” or choose “Custom” and set your own colors for text, background and mouse cursor. Under Scrolling tab, set Scrollback is “Disabled”. Now, you will see the Tilda terminal as your transparent wallpaper to your desktop. Here is how Tilda terminal looks like after setting it as transparent wallpaper in my Arch Linux desktop. If, you have setup Tilda as “always on top”, you can’t view/access other opened applications. In this case, press F1 key to hide Tilda Terminal window and access other opened windows. Press F1 again to bring back Tilda. To quit, press SHIFT+CTRL+q, or right click on any empty area of Tilda window and choose “Quit”. I am quite comfortable with Tilda terminal, and I am going to use it for a while. It allows me to tweak and customize various settings. I really liked the way of its functionality and simplicity. Hope you will like it too. And, that’s all for today. I will be soon with another useful guide. If you like what we do here, please share our guides in your social, professional networks and support OSTechNix.